The goal of this paper is to describe and explain ditransitive constructions in creole languages. By ditransitive constructions we mean constructions with verbs of transfer like ’give’, ’send’, ’show’ which require two objects, a Recipient (or receiver) and a Theme (or patient), i.e. the entity that is transferred  . Thus our class of ditransitive verbs does not comprise verbs like ’put’, ’fill’ or ’load’, which in addition to a Theme role also have a Location role. In this paper we will mainly concentrate on the verb ’give’, which is by far the most frequent ditransitive verb in all languages. Lea gave Teresa a mango. Lea gave the mango to Teresa. There is yet another possibility to link the two objects in question, the Serial-Verb Construction. As can be seen in example (3) from Yoruba, in this case the Recipient is preceded by a "serial verb". This paper is organized as follows : In section 2, we will give an overview of the different ditransitive constructions in creole languages and formulate first cross-creole generalizations which are in part based on Bruyn et al. (1999). In section 3, we will summarize Bruyn et al.’s explanation for the observed trends. In section 4, we will report on a world-wide study of ditransitive constructions, and in section 5, we will concentrate on the situation in African languages. With the typological background in mind, we will tentatively propose an alternative explanation for creole ditransitive constructions in section 6. Mon pran en lit mon donn Napoleon. In (4) we have a quasi serial-verb-construction with a single intonation contour  . Nu te baj zot kat gud. ’We had given you four dollars’. Mon ’n donn Marcel en mang. En kene pi eni en gutu ka. A giv dì man nyam. Meke mi gi en a goni. The IOC is exemplified in (12-14), some creoles have both the IOC and the DOC even with the same verb. Mon ’n donn sa mang ek en zonm franse. Boi i mas soim tupela han long em. The Serial-Verb Construction is also found in some creole languages as shown in examples (15) and (16) from Saramaccan and Haitian Creole. Again, it may occur side by side with other constructions. In this construction the serial verb ’give’ introduces the Recipient and follows the primary verb. Mí mandá biífi dá hen. Mwen pran liv bay Pòl. Amu da wan kuzu da bo. The DOC is universally present in Atlantic and Indian Ocean creoles. From the point of view of the lexifier languages, this widespread attestation of DOCs is surprising, especially in the case of the Romance-based creoles, because Romance languages unlike English or Dutch do not show DOCs (donner qqc à qqn ’give something to someone’, not *donner qqn qqc). So how can one account for this puzzling picture ? Bruyn et al. (1999) have tried to answer this question and in the next section we will briefly summarize their argumentation. Bruyn et al.’s main point is to link DOCs in creoles to language acquisition. They claim that DOCs are the unmarked option in the innate Universal Grammar ("UG") and therefore surface during the process of creolization. With this claim they adopt a creolization scenario similar to Bickerton’s Bioprogram Hypothesis. What is their evidence for such a strong claim ? First, they present diachronic data for two English and Dutch-based creoles, Sranan and Negerhollands, showing that in these creoles DOCs are attested earlier than IOCs. Second, they discuss some language acquisition data from English, Dutch, and French to support the claim that DOCs are the default option for children acquiring these languages. For English and Dutch they try to show that the IOC is not acquired before the DOC. French, which lacks the DOC, would be the ideal case to demonstrate that the DOC is indeed part of Universal Grammar if it were produced by French speaking children before noticing that their parents’ grammar only has the IOC. However, the French child whose data the authors analyzed did not produce any DOCs. Bruyn et al. then begin a complex argumentation to save their claim that the DOCs of Haitian creole (and all other creoles) arose through first language acquisition processes at the time of creolization. We do not find this proposal compelling, but we do not want to go into details here, as our focus is on the cross-linguistic evidence. To sum up : the fact that DOCs are widespread in creole languages, including Romance-based creoles, and that they appear early in the genesis of creole languages, is explained on the basis of the assumption that the DOC is "in some sense a direct manifestation of unmarked values of UG", as Bruyn et al. (1999:356) put it. How can we evaluate and test the innatist explanation ? It seems clear that one further prediction that the innatist explanation makes is that the "universally unmarked" DOC should be clearly predominant in the world’s languages. Quite generally, cross-linguistic frequency is one of the standard "markedness criteria" (cf. Croft 1990 : ch. 4) : For instance, one would say that the sound [i] is unmarked compared to the sound [y] and this correlates with cross-linguistic frequency : The overwhelming majority of languages have an [i] sound, but only a small minority have an [y] sound (see Maddieson (to appear) for detailed cross-linguistic evidence). So do we find a similar asymmetry in the distribution of the DOC and the IOC in the world’s languages ? In order to shed light on this question, we will report on the preliminary results of a survey of ditransitive constructions in about 250 languages from around the world, which Martin Haspelmath conducted in connection with the World Atlas of Language Structures (Dryer et al. (to appear)), a large-scale editorial project that documents typological patterns and maps them geographically (see Haspelmath (to appear)). In order to classify all of the world’s languages with respect to their distransitive construction, we need more abstract definitions than we have used so far, because non-creole languages exhibit far greater diversity than creoles. We divide ditransitive constructions into three major types, depending on the similarities of the Recipient and Theme arguments with the Patient of the monotransitive clause. Thus, we define the IOC construction as a construction in which the Theme is treated in the same way as the monotransitive Patient, and the Recipient is treated differently, as illustated in (a) in Figure 1. The DOC construction is defined as a construction in which the Theme and the Recipient are both treated like the monotransitive Patient, as is illustrated in (b). We should say at this point that we ignore word order and only look at "flagging", that is case-marking and adpositional marking, and at agreement marking, so that it is clear that the DOC as found in creole languages falls under our definition of DOC, because both objects are zero-marked, just like the monotransitive Patient. Finally, there is a third logically possible type that is also actually attested, what we call, following Dryer (1986), the Secondary-Object Construction (SOC). In this construction, it is the Recipient that is treated in the same way as the monotransitive Patient (both count as "primary objects"), and the Theme is treated in a special way (it is the "secondary object"). Let us now look at examples of these three constructions from non-creole languages from around the world. In (20), we see a Korean example which works just like Latin or German : The ditransitive Theme is accusative-marked, just like the monotransitive Patient, and the Recipient is marked in a special way, which we call "dative case". The example in (21) from Jeli, a Mande language of Mali, is similar, but here the Recipient is marked by a dative postposition (munu) while the Theme is zero-marked, just like the monotransitive Patient. Yi kumar s ŋ na munu. The third example of an IOC is from Yimas, a Papuan language of the Sepik-Ramu family, which has no flagging of noun phrases and shows only argument indexing, i.e. agreement marking on the verb. Here we see that the verbal person index k- which agrees with the Theme argument uraŋ is the same index that would be used with a monotransitive Patient. Next we see some examples of the DOC. Some non-creole languages are just like the creoles we saw earlier in that both the Theme and the Recipient are zero-marked, and this is the case, for instance, in Fyem, a Nigerian Niger-Congo language of the Plateau group. But in other non-creole languages, we see that both objects are case-marked with the same case, as for instance in the Australian language Martuthunira, shown in (23) ; this case is called accusative case here. Ngayu yungku-lha nganaju-u muyi-I murla-a. And finally, the SOC construction is illustrated by Chamorro, the Western Malayo-Polynesian language of Guam, where both the Theme and the Recipient are flagged by prepositions, and the Recipient preposition (i) is the same as the preposition that marks the monotransitive Patient, while the Theme (the secondary object) is indicated by the special oblique preposition ni. Ha na’i i patgon ni leche. This construction is extremely rare in creole languages ; the only case we know of is the western varieties of Tok Pisin, where we find a construction such as (25), where the Recipient is zero-marked, like the monotransitive Patient, and the Theme is flagged by the preposition long. God i soim yu long samting em i laik mekim. Actually, the most common variety of this construction is one in which argument marking is only by indexing of the verb and there is no flagging at all. For instance, in the Algonquian language Ojibwa, the Recipient ’John’ agrees with the verb in the same way in which the monotransitive Patient agrees with the verb, whereas the Theme is not indexed on the verb. N-gi :-mi:n-a : mzinhigan ža:bdi:s.
This yields four different types : IOC, DOC, SOC, and in addition a Mixed type, such as English, where both the IOC and the DOC are possible. The result of our study is shown on Map 1 (from Haspelmath to appear). It can be seen that both the IOC and the DOC is very common, and that the SOC and the Mixed pattern occurs sporadically in various parts of the world. We probably do not have to produce any statistics to convince the reader that it would be quite absurd to claim that the IOC is somehow restricted in its cross-linguistic distribution. Instead what seems to appear clearly from this map is that both the IOC and the DOC are major constructions, none of which is in any way unusual or "marked" compared to the other one. It is only the SOC that can be regarded as restricted, but even here, we cannot be quite certain because of some difficulties of classification : In languages without case-marking, it is often quite difficult to keep the SOC and the DOC separate, because many languages have zero-indexing in the third person, and zero indexing and no indexing are often difficult to distinguish. But in addition to the numerical equality of the DOC and the IOC, we see another striking pattern on this map : Especially if we lump the DOC and the SOC together, we see some large areas that are more or less homogeneous. The IOC dominates in Eurasia (except for South-East Asia), parts of Mesoamerica, and South America, whereas the DOC and the SOC dominates in South-East Asia, Australia and North America, as well as in most of sub-Saharan Africa. These are apparently large linguistics areas in the sense of Dryer (1989), i.e. the areas are larger than language families. Thus, the Eurasian area comprises not just Indo-European, but also Uralic, Turkic, Mongolian, Tungusic, the various Caucasian families, as well as Japanese and Korean. 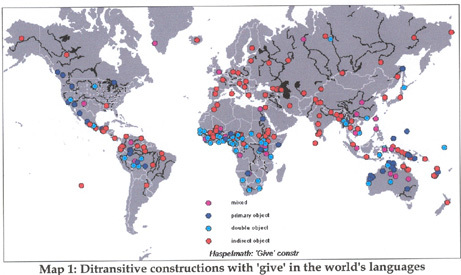 These large-scale geographical patterns can only be explained by language contact — apparently ditransitive constructions are quite susceptible to borrowing across language families. It is true that this situation is quite common. Many structural features of languages show a non-random geographical distribution, which means that many structural features must be susceptible to borrowing. But there are also some features that do not seem to be easily borrowable. For instance, grammatical gender is not something that is easily borrowed from one language to another one, and as a result the world map of gender shows no clear areal patterns (see Corbett (to appear)). This is thus one indication that instead of looking in unmarked innate patterns of Universal Grammar, we should look at the possibility of an explanation that somehow involves borrowing ditransitive patterns. Let us now look somewhat more closely at the languages of Africa, which are important contact and substrate languages for both the Atlantic and the Indian Ocean creoles. The situation in sub-Saharan African languages is shown in greater detail in Map 2, which we will examine now. We see that in sub-Saharan Africa the clear majority of languages show the DOC. Most of the languages on the map are from western Africa and central-eastern Africa, because in these areas the diversity is far greater than in the south. 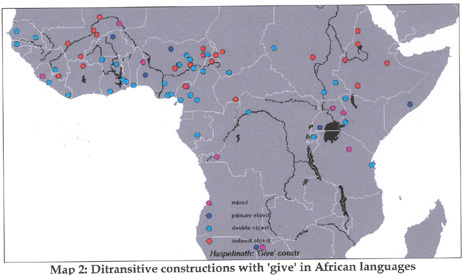 Almost all of central-southern Africa is occupied by closely related Bantu languages, and these all show DOCs, so adding new dots would not have added much new information. We do see three areas where the IOC construction is predominant : in Ethiopia, Semitic and Cushitic languages tend to show IOCs, and in Mali, the Mande languages tend to show IOCs. But these are all interior regions – note that the coastal regions have exclusively double-object languages. Wewillnow cometo our explanation ofthewidespread use of DOCs in creolelanguages. Why do we needanalternative explanation to the one proposed by Bruyn et al. (1999) ? It is not only because of the very questionable assumption of DOCs being "unmarked" in Universal Grammar. Bruyn et al. themselves cite some counterexamples to their generalization from Indo-Portuguese and Malayo-Portuguese. They regard them as isolated cases that should and can be explained away,but we want to argue that there is in fact a larger pattern which requires a different approach. Table 1 shows the outlines of the generalization that we would argue for. As we saw earlier, the Atlantic and Indian Ocean creoles have DOCs regardless of their lexifiers. This is shown in the upper part of the table. But now note that the creoles in India, Indonesia and Melanesia do not have DOCs, again regardless of their lexifiers. This is shown in the lower part of the table. Since we saw that the relevant African substrate languages overwhelmingly show DOCs, whereas the languages of India, Indonesia and Melanesia largely show IOCs, an explanation in terms of substrate influence becomes attractive. We are not the first to propose a substratist explanation. There have already been proposals by Koopman (1986) and Lefebvre (1998) who have claimed West African substrate influence for DOCs in Haitian, and Kihm (1995) has suggested a substrate influence for Tayo. But so far nobody has attempted a global view of ditransitive constructions in creoles and their substrate languages. A whole range of Portuguese-based creoles do not display DOCs, in particular the Asian Portuguese creoles of India, Sri Lanka, Malaysia and Indonesia. We find examples such as (26-28) from Malacca Portuguese Creole, Malayo-Portuguese and Tugu Creole where we find the IOCs marked by ku/kum ’with’ and no DOC. Kantu kere da akel ondra kum yo. Iste figura yo bende ku ele. The influence of the Malay substrate is particularly convincing because in Malay the indirect object preposition sama also means ’with’. An example of colloquial Malay from the Indonesian province Riau is given in (29). Kenapa David tak kasi ikan sama dia. E:w eli-p« dine:ru ja :-dá :. Now let us look at some Melanesian creoles. The only Romance-based creole spoken in this area is Tayo, which only shows IOCs and is thus another counterexample to Bruyn et al. (1999) that they seem to be unaware of. Sola done fam pu lja. Sa done lachferi a lja. The possible substrates of Tayo are very numerous, but apparently very similar to each other, so that the examples in (34) and (35) are probably representative. Kó pá nrè xì-re wââtu yò nrí. U hwari nrî ei rri. In English-based creoles of Melanesia, the DOC seems to be absent at least in Solomon Islands Pijin and Bislama. (36) shows Solomon Islands Pijin, and (37) is an example from an indigenous language of the Solomons, which we take as representative for the substrate languages. Yu givim kaikai long hem. ’E-meru meru kwate-a boo ba’ita fa-na. Mi givim buk ia long Pita. Solomon Islands Pijin and Bislama are remarkable because the DOC is so prominent in their superstrate language English, and yet they lack this construction. On Map 3, we see that the western languages of Indonesia and the (south-)eastern languages of Melanesia, i.e. 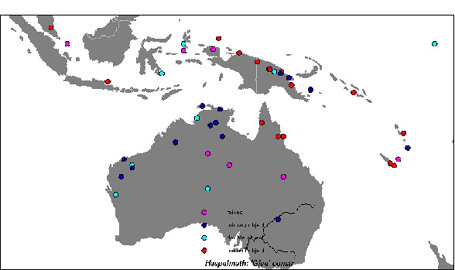 the substrate languages for creoles in the region, predominantly show the IOC, not the DOC (this construction is also found in the area, especially in Australia, eastern Indonesia and inland New Guinea, but not to a significant extent in languages that were substrates for creoles). So we believe that a good case can be made for a substrate explanation of ditransitive constructions in creole languages. Of course, the strongest evidence for substrates comes from features that are not only absent in the superstrate, but also rare in the world’s languages. The DOC is in fact very common in the world’s languages, as we saw earlier, but the IOC is about equally common. However, what makes our case relatively strong is the fact that the explanation works for a large number of creoles, and that our cross-linguistic picture of ditransitive constructions is unusually rich due to the typological data that we presented. Bickerton, Derek (1995), "The syntax of creole languages", in : Jacobs, Joachim & von Stechow, Arnim & Sternefeld, Wolfgang & Vennemann, Theo (eds.) Syntax : An international handbook of contemporary research. 2 vols. Berlin : de Gruyter, 1451-62. Bollée, Annegret & Rosalie, Marcel (1994), Parol ek memwar. Récits de vie des Seychelles, Hamburg : Buske. Bruyn, Adrienne & Muysken, Pieter & Verrips, Maaike (1999), "Double-Object Constructions in the Creole Languages : Development and Acquisition", in : DeGraff, Michel (ed. ), Language creation and language change, Cambridge : MIT Press, 329-373. Carrington, Laurence D. (1984), St. Lucia Creole. A descriptive analysis of its phonology and morpho-syntax, Hamburg : Buske. Chaudenson, Robert (1974), Le lexique du parler créole de la Réunion, 2 vols., Paris : Champion. Croft, William (1990), Typology and universals, Cambridge : Cambridge University Press. Dench, Alan Charles (1995), Martuthunira : A Language of the Pilbara Region of Western Australia. (Pacific Linguistics, C-125.) Canberra : Australian National University. Dryer, Matthew S. (1986), "Primary objects, secondary objects, and antidative," in : Language 62 : 808-845. Dryer, Matthew (1989), "Large linguistic areas and language sampling", in : Studies in Language 13:257-92. Dryer, Matthew & Haspelmath, Martin & Gil, David & Comrie, Bernard (eds.) (to appear), World Atlas of Language Structures, Oxford : Oxford University Press. Ehrhart, Sabine (1993), Le créole français de St-Louis (le tayo) en Nouvelle-Calédonie, Hamburg : Buske. Faraclas, Nicolas G. (1996), Nigerian Pidgin, London : Routledge. Foley, William. 1991. The Yimas language of New Guinea. Stanford : Stanford University Press. Huttar, George L. & Huttar, Mary L. (1994), Ndyuka, London : Routledge. Keesing, Roger M. (1985), Kwaio grammar. (PL-B, 88.) Canberra : Australian National University. Kihm, Alain (1995), "Tayo, the strange bird from New Caledonia : determiners and tense-aspect in Tayo and their implications for creolization theories", in : JPCL 10:2, 225-252. Koopman, Hilda (1986), "The Genesis of Haitian", in : Muysken, Pieter & Smith, Norval (eds. ), Substrata versus Universals in Creole Genesis, Amsterdam : Benjamins, 231-258. Lefebvre, Claire (1998), Creole genesis and the acquisition of grammar. The case of Haitian creole, Cambridge : Cambridge University Press. Lord, Carol (1993), Historical change in serial verb constructions, Amsterdam : Benjamins. Maurer, Philippe (1995), L’angolar. Un créole afro-portuguais parlé à São Tomé, Hamburg : Buske. Michaelis, Susanne (1994), Komplexe Syntax im Seychellen-Kreol, Tübingen:Narr. Nettle, Daniel (1998), The Fyem language of northern Nigeria. Munich : Lincom Europa. Osumi, Midori (1995), Tinrin grammar. Honolulu : University of Hawai’i Press. Simon, Linda & Young, Hugh (1978), Pijin blong yumi. A Guide to Solomon Islands Pijin, Honiara : Solomon Islands Christian Association. Topping, Donald M. (1975), Chamorro reference grammar. Honolulu : University Press of Hawaii. Tröbs, Holger. 1998. Funktionale Sprachbeschreibung des Jeli (West-Mande). (Mande Languages and Linguistics ; 3) Köln : Köppe. Tryon, Darrell T. (1987), Bislama : An introduction to the national language of Vanuatu. Canberra : Australian National University. Veenstra, Tonjes (1996), "Grammaticalized verbs in Saramaccan : the interplay between syntax and semantics", in : Baker, Philip & Syea, Anand (eds. ), Changing meanings, changing functions. Papers relating to grammaticalization in contact languages, London : University of Westminster Press, 95-112. Verhaar, John W. M. (1995), Toward a Reference Grammar of Tok Pisin. An Experiment in Corpus Linguistics, Honolulu : University of Hawai’i Press. We prefer the term "theme", which is not to be confused with "theme" in the (information-structural) theme/rheme-distinction. See Michaelis 1994:45ff. for detailed discussion.